over which I put leather covered wood. The joints were wired through the aluminum and they move freely. It was suggested to me that the back I originally designed was too tall so I removed it from the aluminum and cut it down. I then carved wooden legs for the front and cut curved legs for the back. I used thin wood to cover the aluminum. The entire unit was then placed on a piece of wood which will be inset in the floor and will be hinged so it can be tilted back and the victim can be dropped down the chute. 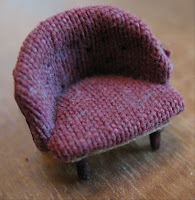 Once I felt that the chair worked well I set to work on the large oven and meat grinder that would go in the cellar. 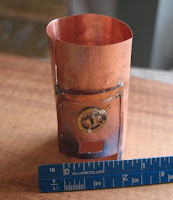 For the meat grinder, I used copper to form the hopper with a flared top. That was very difficult to keep together and in place but with many trials I was able to glue it again using Future Glue. 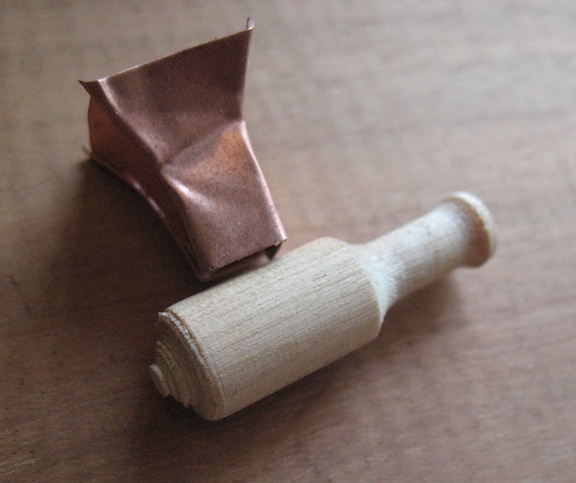 I turned the extruder part of the grinder at the end of a wooden dowel and used camera and watch parts on the ends to simulate the grinder handle. 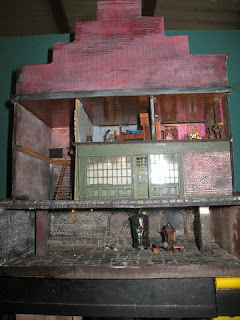 I may have to tweak the pieces once I am ready to install them in the cellar but for now I am fairly pleased with them. is the Pie Shop (the worst pies in London) and above is the attic/barber shop. 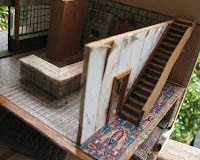 I needed to plan the floor openings and chute to run from the top floor to the cellar. 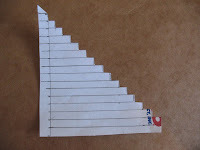 I first graphed the layout of the Pie Shop to see where and how the chute could come down. Next was to see how it fit in with the attic floor and once those parts were planned I cut a rectangular opening in both floors. It will be some time before I am able to test this chute but the building is being planned for access so if necessary later I may have to enlarge the chute slightly. In order to keep the building fairly solid but not wanting to use thick wood I made a back from half inch plywood and cut grooves across to set the floors into. I shouldn't need to glue those parts so if I need to disassemble it for any reason I am hoping it can be taken apart. At least that is what I plan. Grooves cut so I can now work on the most complicated floor, the Pie shop. A diagram from the movie set was my guideline for size and placement of architectural parts. I made a graph diagram for everything and proceeded to cut the walls, front, etc. from light weight fiber board that is often used for paneling in trailers. The building will have front opening doors so I can retain the outside architecture. I hope to use a tube hinge when it is time to set it up. I built counters extending into the shop, doorways, and window openings. I am trying to decide if I can do a decent job building the windows myself or if I should try to use ready-made plastic windows. Sadly, there are MANY windows! For the front of the building I used rectangular panels created with 1/32" strip wood and mitered the corners. Not perfect by any means but I like the effect regardless. I had cedar strip wood with grooves cut that made nice upright decor, and other small stripwood was used for the base. I then painted the front inside and out with a forest green and used a very thin black wash over that when the paint was dry. 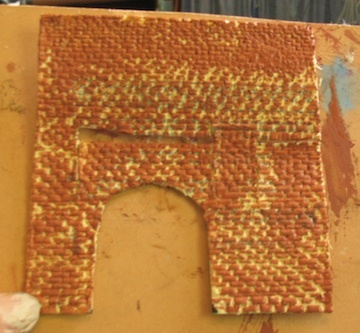 I made the brick wall using Delight (similar but softer than PaperClay) rolled very thin and scored to resemble old bricks. That panel was painted with a variety of colors and some white chalk dust was rubbed on the surface in some areas. The photo references I used showed white mortar with the red brick on old buildings, but as I see it now it seems very white. I may need to tone that down a bit. show through. My biggest concern is that the tiles look too shiny so I will experiment with painting clear mat spray over it to tone it down. For the counter top, I have painted the wood top with white brushed thin enough that the wood color shows through. I cut the acetate tile large enough to fold the edges over the edge of the counter. It was a bit tricky to fold that small a piece but it was accomplished. The acetate will then be glued to the counter top and a card stock panel will cover the wood frame to give a nice smooth finish. This saves a lot of sanding and fine finishing and still looks decent. 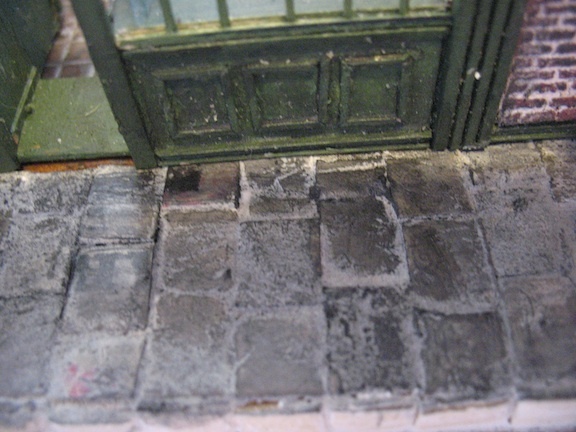 I discovered that a wash of half white glue and half water gave the tiles just the right dullness and slight texture. Thinned white paint was then floated over the top to create grout and dark areas were added for a worn and dirty look. Bricks! Under the shop is the oven, the huge meat grinder and the sewers. 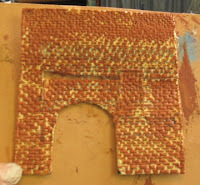 I learned of the perfect material for my bricks and have been making the back wall. Bricks are from foam egg cartons (Depron) that are scored and then painted with dark brick colors - reddish brown, grey, black - all mixed together to get uneven effect. Light-weight spackle was then applied as mortar and dirty fingers used to rub areas. Some sanded pencil lead also adds to the effect. I was only able to do the back wall today as I ran out of foam, but it will cover the roof and pillars and large tiles will be used for the floor. Need to buy more eggs tomorrow! Got more egg carton but other work called so I didn't get much accomplished. the tunnel backgrounds are printed but need to be coated with some kind of fixative. 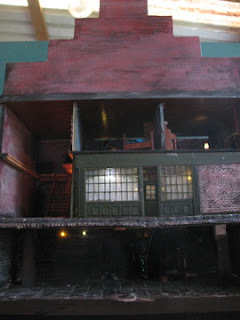 I built the stairs going up to Mrs. Lovett's parlor by stacking wood pieces to the correct height to go through the upper floor. They were glued to the side wall. There is so much temptation to glue everything together and I need to restrain myself because it will be very difficult to decorate if I glue it. I need to decide if I should weather the stairs and leave them wood or try to find something that will make an appropriate runner. Wall treatment is another decision to be made. I finally took the plunge to make my own window lights. Very tricky and it took me a bit of experimenting to get it to work. 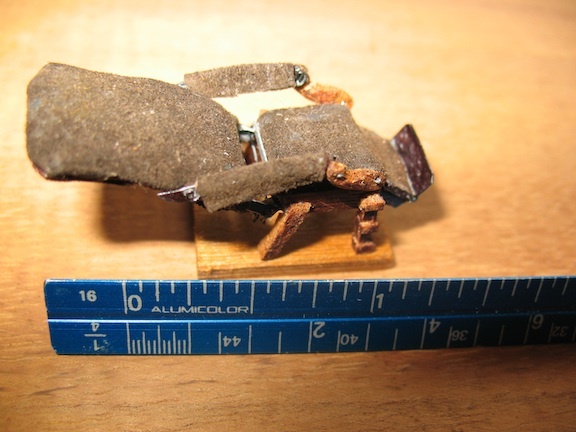 I am using 1/32" basswood (I think) and it is very fragile. I have been thinking for days how I could make a jig and I thought I had it figured out. 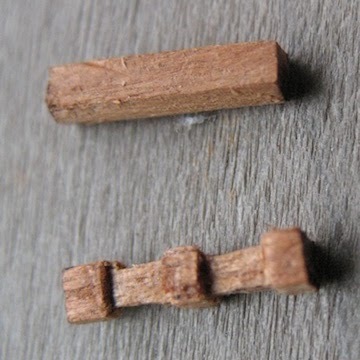 I cut very small slots in a piece of wood to hold the strips in place so I could file them where they cross. The only problem was that the wood slipped slightly when I was cutting the channel so they were uneven. I finally decided to just use one horizontal and one perpendicular as the only thing I needed to do was file the spots along the wood. This actually worked after I filed the slot just a tiny bit wider so it would hold the square strips in place firmly. My first attempts at gluing were a disaster. Zap-a-Gap CA glue didn't work well but once I decided to try Future Glue (plug here - my all time favorite glue) it went very well and I finished one of the two large panels. I am now trying to find out what glue would be best to glue the acetate to the frame pieces so it can all hold together well and be strong. Questions have been asked and experiments are now in order. Today (28th) I did glue tests to attach the window lights to the acetate. It seems the best but not perfect method was a very fine coat of Ultimate Glue on the wood and drop the piece gently on the acetate. Let dry. There were a few spots that didn't hold well but a bit of glue fixed those and at least the glue didn't show. Windows look even more crooked now, but they will be along the side of the building and not visible straight on. 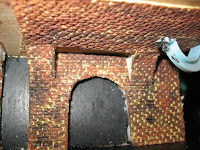 I got one more egg carton and worked on scoring bricks for the cellar ceiling. They got layers of paint starting with a reddish brown, grey, and then black. Once dry more black was smeared on to good effect. I also began the tiles that will cover the bottom floor and step up. A few have now been glued in and mortared just to see how they will work out. I spent a lot of time making the "brick" panels - boring and not exciting to write about but I am so happy with the results. 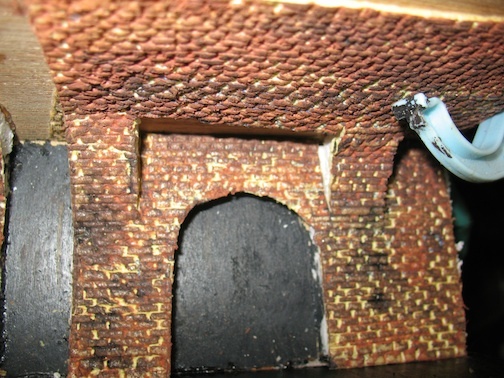 The sewer level is pretty much done except for pillars and some fill in. I then did the floor making large "slab" blocks and because of a very happy accident they turned out wonderful! I had originally made them on a single sheet like I did the bricks but they looked awful when I finished painting them. and used the side I had glued. These were placed individually and then painted and mortared with lightweight spackle with the results as shown in the photo. I also have a new technique to add to my repertoire. 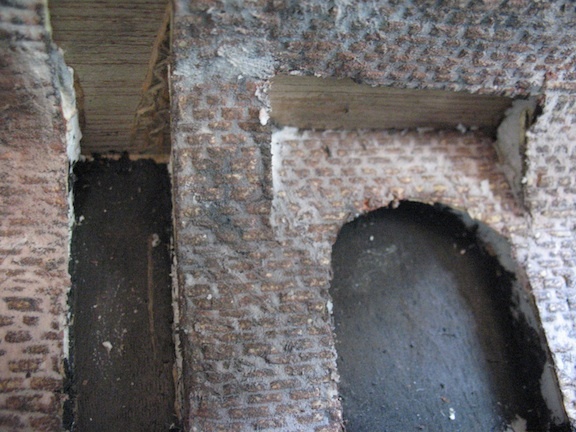 holes in the building wall and the cut parts of the tube are glued to the wall section and the front section as you can see below. Panel is in place and closed. 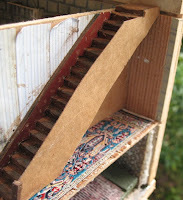 I forgot to mention that I also worked on the stair well and added peeling wallpaper, carpet (I still need to dirty it - very reluctant but it must be done!) and wore the stairs down in the center. 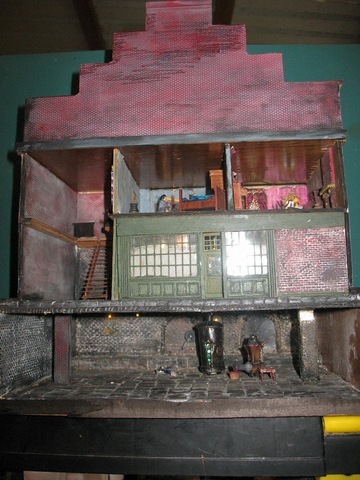 and much work on the finishing touches of benches and windows and did the side door. 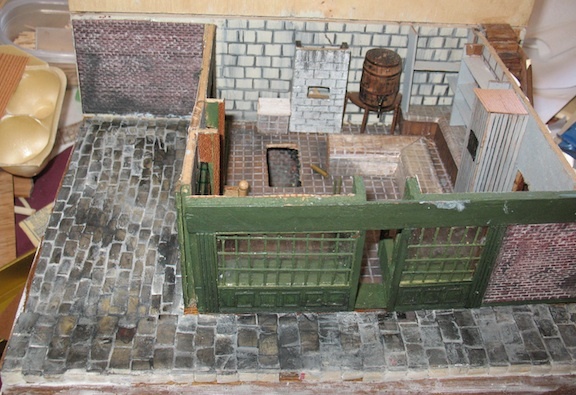 The sidewalk blocks for the courtyard and the back brick wall were added but sidewalk isn't quite finished and needs to be painted. Each paver is placed individually so this is a very long and tedious job. A decision needs to be made about making more shelves to attach to the front opening side - it would mean making a LOT more dishes, etc. It could be something to add later. Another accidental discovery - some super glue got on one of the windows and although I didn't worry about it because the windows will be dirty, I happened to drip a little clear sealer and it cleared up the cloudy area on the window where it dripped. I have also been researching light fixtures and trying to plan the lighting before I assemble areas that will be more difficult to reach later. of the paint mixing together. After I added the spackle I still wasn't happy with the results. Rubbed on more paint in spots and let things dry. It is now looking pretty decent. 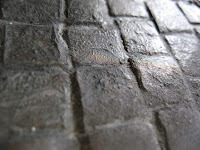 Not quite how I planned it to look, but it is an effect of old pavement. I am pretty sure the front opening will swing out okay. Measure the height from bottom to top of the stairs and draw a perpendicular line on a piece of paper. 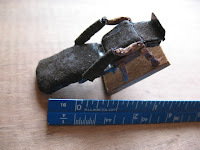 Decide how many inches your risers will be - in my case I decided on 9" so for quarter inch scale that is 3/16th". Mark that spacing along your perpendicular line and do the same a bit away from it so you can draw parallel lines across the paper. Decide how far out the stairs will go or how steep you want them, and complete a right triangle to the top of the perpendicular line. You now have a properly spaced riser. 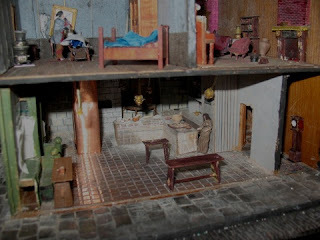 For this scene I will lay the paper pattern I just made on 2 thin pieces of wood (double sided tape between them) and I will cut the wood risers. 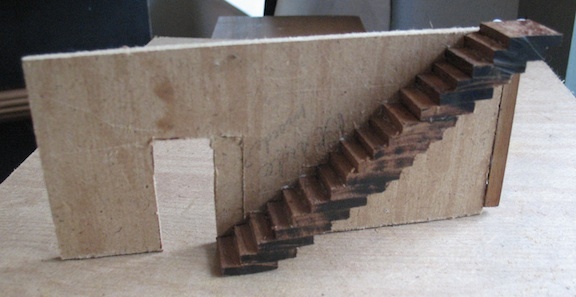 The stairs themselves will be cut from very heavy brown file folder. 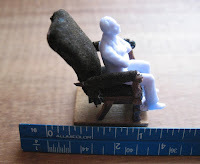 It is easy to cut and work with and is a nice thickness for quarter inch scale. Plus it is almost as strong as wood and has a lot more integrity. I haven’t posted this week because most of what I have worked on was just finishing and planning. I did create some tiny hurricane lamps that will be lighted with optic fiber, and a couple of other fixtures as well. Most of my time was taken up making prototypes - figuring what works for scale, searching my stash for findings and beads, drilling and finally finishing one. Now it should be easier since I know what I am doing (I think). I received a “fire kit” that I had ordered and set it up inside the oven and I love it. The little LEDs flash color and I may try a piece of yellow cellophane instead of the rainbow cellophane that came with it. Planning the lighting and where wires will go took up much of my time and yesterday I started on the roof which will involve some hinge and wiring so I can’t really make much progress until that is done. Glued it together and now I need to find my tubing to create the hinge. This will also require more bricks! OUCH! I will spend some time on line looking for QS brick sheets as there is just too much outside area to cover bit by bit with foam egg cartons. I now have a major design problem to work out and writing here should help me. The various levels in the building are different widths and parts would normally be open. But the box has sides so my dilemma is to figure how to integrate the sides with the various levels. Options so far are to cut them off even with the walls or just brick them. The bottom level can be extended a bit to meet the sides which have to be wider to support the street level. I definitely want the curb and cobblestones to be a part of it. The upper level is set back a bit and has a clear piece of acrylic instead of a solid wall. This is to be able to see the barber shop but doesn’t need the architectural interest of the shop level. This is the part that will require the most careful thought. It is a “Design as you go” project! I cut a piece of cardboard so I could try out the cut and it seems to be better. I think these decisions and trials are the hardest part of creating what I envision. I now see another important aspect of posting a blog - or at least writing in it. A break from frustration! This is how I spent my not very productive morning. Well, the first was productive as I cut the wood sides for my building and I am pretty sure I like them better now. Decided to put more holes in for the electric wires and other necessities in the back of the building. I want the top floor to pull out for other access and this has already been a challenge for stairs, etc. I want to use a small plug for the wiring that will go on the top floor so I drilled some holes for the little metal tubes that will form the “outlet.” Tubes are wired (stole them from another electrical XMas thing.) These don’t go all the way through my plywood back and they also have a large blob of solder on the wires so I figured I would just carve out a place so the wires will fit. Here is where the fun begins. Dremel tool that I have in my back workroom doesn’t have the carving bits. Go to the other room where I have spread out everything and find a couple of possible bits. Go back to the workroom but still don’t have the right tool. (It would NEVER occur to me to take the entire box of bits to the workroom :~) ) Finally decide to work on a different part that I really wanted to try out - the drop down part for the chair. It needs to be accessible from the outside of the building and be fairly simple. I decided a fine piece of strong nylon thread might work. Tried to drill holes but the adjustable collet kept loosening so drill bit only worked part way. After a number of tries to tighten it I decided to see if the small drill bit would fit my regular drill. Yup! Great. Plug in drill, doesn’t work. Try a different outlet on my strip - still doesn’t work. Go to other side of room and plug into a different strip and it works fine! Bring room box to drill and finally get hole drilled. The first cord I tried was a twisted fine silk or nylon and it kept catching on the wood so I finally found a piece of crochet cotton and that seems to work okay. I have the wood trap door hinged temporarily with a piece of masking tape to try all this out and it isn’t as loose as I would like but perhaps with the chair on the trap door it will give it more weight. 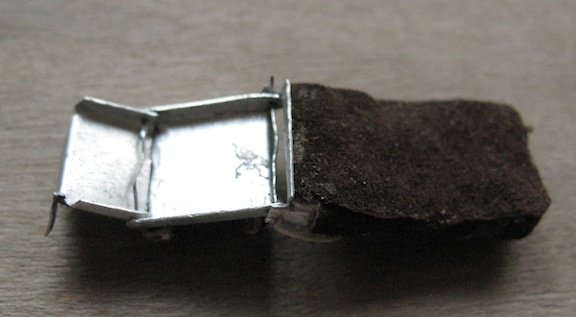 Otherwise a small bit of lead underneath should do it. I also think if I can line the hole that the thread goes through it will be a lot more smooth. 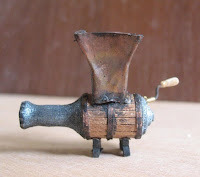 At present I can’t find anything that will work - trip to hardware store is in order. 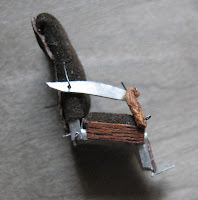 My next thought is how to anchor the thread on the outside and I have decided a small magnet glued to wood and one to thread should work just fine. Or metal on wood and magnet on thread. Whew! All of this has eaten up a couple of hours and I just needed to get away from it for a bit. 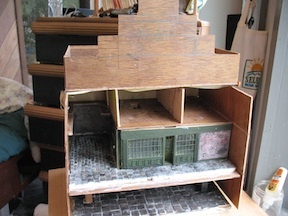 August 23 I have cut the sides and I have finished the box roof which has the stair- step front. I think it will look pretty Victorian once the bricks are applied. Sides are taped on and roof is set loosely on top. One of the sockees suggested the tubing from a Q-Tip which was perfect for the thread hole. I realized that I needed to make the false floors so I worked on that today and until I am able to place some furniture I won't know where the electric holes will have to go. Building is pretty much as done as I can be with it until bits are in as I can't glue the sides just yet. I did cut the box for the roof and also cut the stair step effect for the front. Also waiting for sheets of bricks to use on the outside as I just couldn't see making that many egg carton bricks. Not only would it take me another week or more of work, but it is hard to get foam egg cartons unless I buy the eggs and I just can't eat quite that many that quickly! 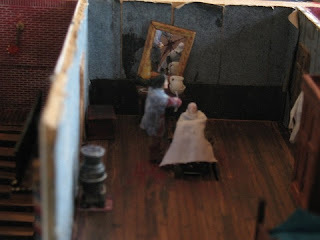 I made one false door for the parlor side and will need to make another for the barber shop side. It was kind of fiddly so I put it aside to do the other door later. I decided to start work on some of the parlor items so I went through the swap items I have received that could work and I started on a tiny Victorian piano (or harmonium?) Got the base of it glued but it was late and have to let glue dry before I can add more to it. 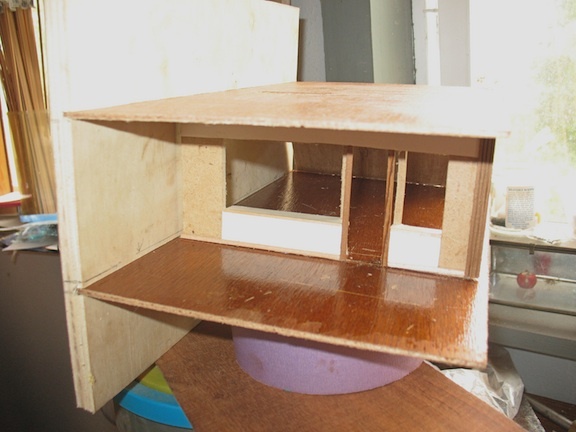 I used strip wood for the basic parts and the heavy brown file folder material for the sides and top. It is the weight of thin veneer but doesn't split and is an excellent material to work with. 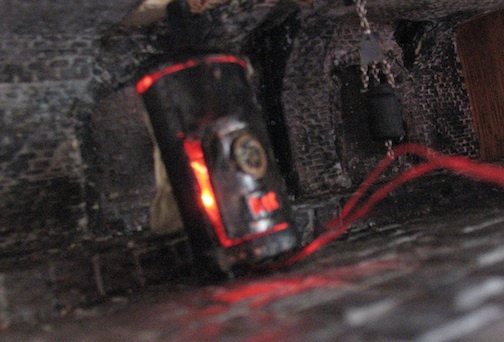 Also have a couple more little lights made and some fiber optic candles. Much more but again will need to have placement first. I have tested the lights and so far everything is working okay but much can happen before it is set! Finished the main part of the piano but need to clean things up and of course do all the finishing touches. Search will be on for what can go on the piano. I also got the fireplace done except for the bricks inside and that too will need bric-a-brac for the mantle and picture for over it. Finding the stuff I need is very time consuming! Aug. 28 I LOVE THE LITTLE PIANO! I made a big push to get all of the little finishing details done on my piano and I think the end result was worth the effort. fancy music rack so I draped some sheet music on the top shelf. I still need to make a piano stool. I had my miniature club meeting today and asked a member to bring some small punches so I spent much of my time punching out various materials to make plates, meat pies, and have enough left for other things. I found a very gauzy, driapey material to use for the curtains. I wanted to cut scallops at the top to attach to the curtain rod so I coated a line of wood sealer and it cut nicely that way. The brick sheets arrived so I can start painting those soon. No work today. My morning was difficult (changing a flat tire and back was sore) so I spent the afternoon sorting and trying to clear my floor area so I can find tools and not trip on the stuff I had out. Good time to bring this blog up to date. I took some trips to the East Coast to visit family and brought materials to work on furniture for the parlour. My efforts worked out well and I even discovered/invented some techniques. Well I hadn't seen them and they were developed by experimentation so I think I invented them. 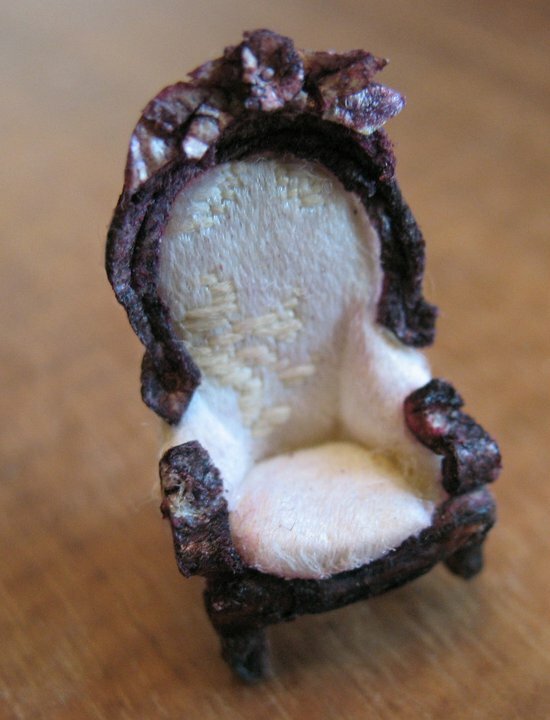 I combed the internet for Victorian furniture at various antique sites. 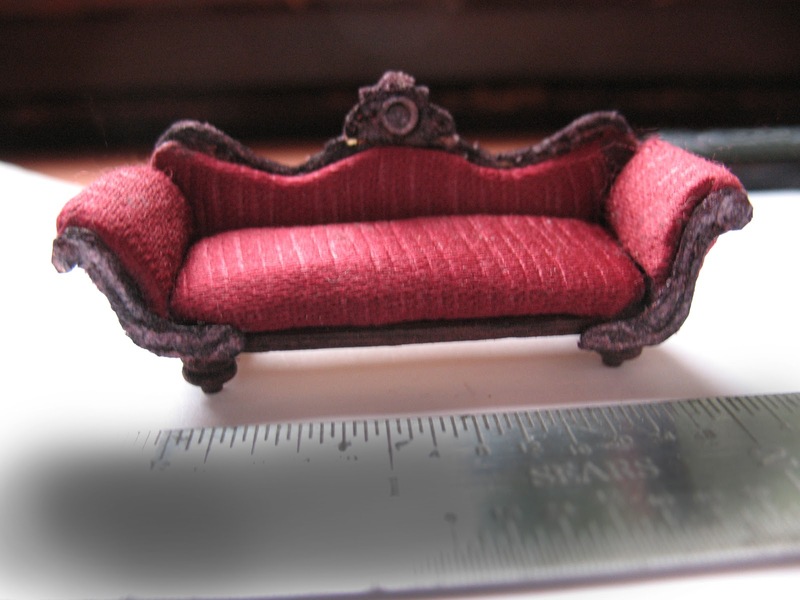 I saved many photos for inspiration and my next project was to develop ways to construct fancy furniture in quarter inch scale. The answer was that same egg carton foam I had used for brick work. 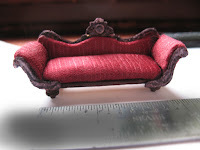 My Victorian sofa was the first (and perhaps best) of my efforts. 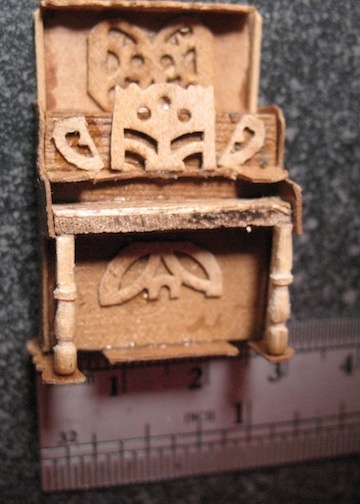 I was able to create the effect of carving on the back of the sofa and I strengthened the rest of it with file folder card stock and bits of wood. This is the end result. In one of my copies of Scale Cabinetmaker there was a project for a Victorian potbellied stove which I always thought would be fun to do. 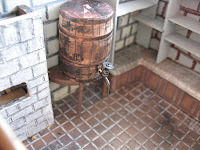 I seldom use plans or kits but in this case I wanted to transform it into quarter inch scale. I turned the main part of the stove on my lathe and then added the other bits - fine white electric wire, thin zinc printer sheet, beads and a couple of other things. I was very happy with the end result and I know it will take the chill off that infamous barber shop and living quarters. Life and some other commitments have gotten in my way so my project has been on hold for over a month. Last week I was able to get back to work and I decided to work on some of the electrification - especially the most difficult part with the slide out floor. I had to first design some hanging fixtures to emulate gas lights and at least that part was fairly easy since the covered wires would resemble gas lines. I have found that the very bright LEDs can be toned down by using an ochre colorant inside the beads or on the lights themselves. I used 1mm bright LEDs for these fixtures with faceted plastic beads that I partially cut and drilled large enough to accommodate the light. Another bead from my stash worked well for the base. These were very similar to the lamp I made last year but the cord hangs down feeding the lamp from above. 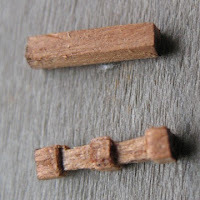 were plug connectors which I removed and the male part was to be used for the sliding floor and the female part would extend through a hole in the wall so when the floor slid in the parts would line up. Hours of juggling, rebuilding the attachments and generally being frustrated it now finally seems to work. until I found some old XMas decorations I had purchased on sale to use for the parts. 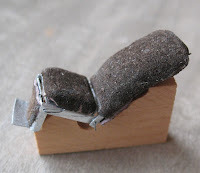 There were plug connectors which I removed and the male part was to be used for the sliding floor and the female part would extend through a hole in the wall so when the floor slid in the parts would line up. Hours of juggling, rebuilding the attachments and generally being frustrated it now finally seems to work. First order was to find a clear plastic bead that would work for the globe and I recalled some beads on a garage sale find some time ago. There were some long beads with segments that were exactly the size I needed so I sawed those off and then looked through my bead stash for something for the base. The original long bead, chip LED, base bead and grey wire stripped for attachment. I had to drill part of the beads so they would be wide enough to accept the chip LEDs and after doing that I used a Sharpie pen to color the inside of the clear bead. 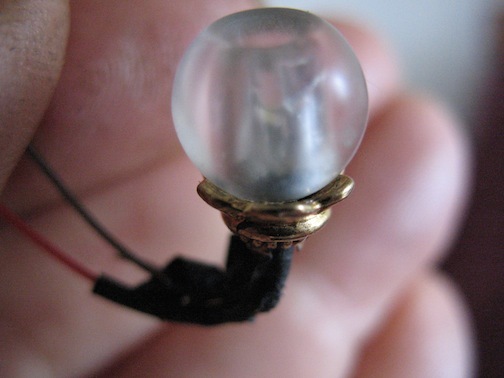 I then strung the LED through the base and glued the globe over that with the wider side against the light. Fit perfectly! The piece of grey wire was from inside a telephone cable and I pulled out the center wire and insulation so I had a thin hollow tube. This was strung onto the LED wire to create the effect of a gas line. A small flat brass disk finished off the end that will go against the wall. My plan if I am successful is to run the lighting through an Arduino which I can program to flicker to emulate flames. If I am able to do the same with optic fiber run through a bugle I will run the circuits separately. This is low on my list of finishing things. Yesterday and today I worked on finishing some of the fixtures and installing them. I drilled holes in the back wall to accept the wires and the left shop wall received a channel across the top so the wires could be glued into the channel. I temporarily hooked up all of the sections to two separate battery packs so I could see where I might need to make changes. A few of the lights still seem too bright so they will be toned a bit with Sharpies but I need the brightness dso the areas in the back can be seen. A true balancing act! A challenge was issued to complete an unfinished project by the end of the month and I decided to try to do this as it has stretched out long enough and there was not that much to make it ready to exhibit. Furnished with panels removed for viewing. Sweeney prepares to do his dirty work. The biggest problem I was having was to integrate the back where the electrical works were housed into the building as a whole. It finally dawned on me what to do and I was amazed that I didn't figure it out earlier! I made a slight extension that would cover the battery pack and set up a sliding panel which was covered with the same brick as the rest of the building. The panel slides out easily for access to the batteries and it all works! There are other things I will want to do with this project, but with a show coming up at the end of this year it is actually ready for display. I hope I can do the additional things such as programing an Arduino so lights can come on at different times. Something else I have in mind is a sound module that issues a scream and gurgle when the victim is killed but perhaps that would be a bit too much realism!